Thomas Paine was born in 1737 in Thetford, Norfolk, England. His father was a manufacturer of rope stays used on ships, and after attending grammar school, Paine was apprenticed to his father. Later, he held a variety of positions in England, including excise officer and school-teacher. Paine also opened a tobacco shop, but it failed, and the resulting financial difficulties put Paine in danger of debtor’s prison. He was saved from this fate by Benjamin Franklin, to whom he had been introduced by a fellow excise officer. Franklin suggested to Paine that he should emigrate to America, and he set sail in 1774. Thomas Paine barely survived the voyage to America. The water on board had been polluted with typhoid fever, and when the ship arrived in Pennsylvania, Paine was so ill that he had to be carried ashore. Franklin’s physician nursed the sick man back to health. Paine then became a citizen of Pennsylvania, and in 1775 he found work as editor of the “Pennsylvania Magazine”, a post which he filled with distinction. 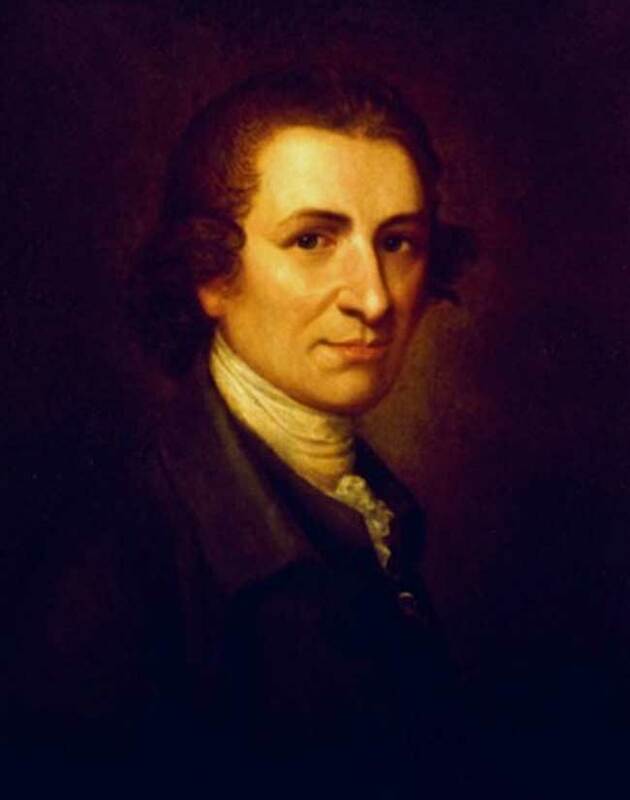 In Pennsylvania, Thomas Paine became an enthusiastic supporter American independence movement, and in 1776 he published an immensely successful pamphlet entitled “Common Sense”. Ultimately half a million copies of this pamphlet were sold in the American colonies, whose population at that time was only 2.5 million. In proportion to the total population, Paine’s pamphlet sold more copies than any printed work ever published in America, before or since. Besides readers who owned copies of “Common Sense”, many others heard it read aloud in homes or taverns. The revolution against the English monarchy had already started, but Paine’s pamphlet encouraged enlistment in George Washington’s Continental Army and it supplied the the colonists with strong arguments for independence, Because of this, Paine is often called “the father of the American Revolution”. In the main body of the pamphlet he opposed the idea that the English constitution is good for America: “I know that it is difficult to get over long standing prejudices, yet if we suffer ourselves to examine the component parts of the English constitution, we shall find them to be the base remains of two ancient tyrannies, compounded with some new republican materials. First: The remains of the monarchal tyrrany in the person of the king. Secondly: The remains of the aristocratical tyrrany in the persons of the peers. Thirdly: The new republican materials in the persons of the commons, on whose virtue depends the freedom of England. “There is something exceedingly ridiculous in the composition of monarchy; it first excludes a man from the means of information, yet empowers him to act in cases where the highest judgement is required. The state of a king shuts him off from the world; yet the business of a king requires him to know it thoroughly; whereof the different parts, by opposing and destroying each other, prove the whole character to be absurd and useless. The Continental Congress sought financial help from France to support the revolutionary war against England. Thomas Paine was sent to France as one of two negotiators. He landed there in March 1781 and returned to America in August with 2.5 million livres in silver, as part of a “present” of 6 million and a loan of 10 million. Paine returned to England in 1787 and he soon became involved a debate concerning the French Revolution. In 1790, the conservative writer Edmond Burke issued a pamphlet entitled “ Reflections on the Revolution in France”. Burke’s pamphlet was an argument for retaining traditional methods of government. Since they had evolved slowly and had been tested over long periods of time, Burke argued, traditional forms of government were more trustworthy than institutions that was newly invented. Burke’s pamphlet provoked a storm of refutations, and Thomas Paine joined the chorus with a pamphlet entitled “The Rights of Man”. He first offered this pamphlet to the liberal publisher Joseph Johnson. However, Johnson had been warned by government agents that if he printed anything by Paine, he would be speedily imprisoned. Paine himself was warned by William Blake that if he returned to his lodgings, he too would be imprisoned and probably hanged. Blake advised him to flee to France. Before leaving for France, Paine entrusted “The Rights of Man” to another printer, J.S. Jordan, who risked arrest by publishing it. Nearly a million copies were sold! Details of the publication were handled by William Godwin, Thomas Brand Hollis and Thomas Holcroft, all of whom were close friends of Paine. In England, Thomas Paine was tried in absentia for writing “The Rights of Man”, and he was convicted of seditious libel against the King. Of course he could not be arrested and hanged by the English government, because he was in France. Despite not being able to speak French, Paine was elected to the French National Convention. However, France at that time was not a safe place, since rival revolutionary factions were fighting for control of the country. Paine was arrested in 1793 by Robespierre’s party because he supported the rival Girondists After narrowly escaping execution, Paine was finally released from prison through the diplomatic efforts of the future American President, James Monroe. Thus Paine survived the critical days until the fall of Robespierre, after which he lived safely in France for a number of years. Thomas Paine argued that government’s only purpose is safeguarding the individual’s safety and inherent, inalienable rights; each societal institution that does not benefit the nation is illegitimate, especially monarchy and aristocracy. Many of these ideas were already circulating during the Enlightenment period, for example in John Locke’s “Second Treatise of Government”. Paine developed these ideas further, helped by conversations with Thomas Jefferson, who was also in Paris at that time. In the final part of “The Rights of Man”, Paine proposes that a reformed English Constitution should be drafted, along the lines of the American Constitution. He advocated the elimination of aristocratic titles, a budget without military allocations, lower taxes and subsidized education for the poor, and a progressively weighted and increased income tax for the wealthy. Napoleon claimed that he slept with a copy of Paine’s “The Rights of Man” under his pillow. Napoleon was once friendly with Paine, but when he assumed the title of Emperor, Paine denounced him as a charlatan. The Uruguaian national hero Jose Gervasio Artigas became familiar with and embraced Paine’s ideas. Many of Artigas’s writings drew directly from Paine’s, including the “Instructions of 1813”, which Uruguayans consider to be one of their country’s most important constitutional documents; it was one of the earliest writings to articulate a principled basis for an identity independent of Buenos Aires. Interestingly, like his lifelong friend and mentor Benjamin Franklin, Thomas Paine was also an inventor. Single-span iron bridges designed by him have been constructed in many parts of the world, and he contributed to the improvement of the steam engine. In 2002, Paine was voted number 34 of “100 Greatest Britons” in a public poll conducted by the BBC.